BEIJING - The central bank raised the amount of money that banks must hold in reserve by 50 basis points on Sunday - the fourth hike this year - to mop up excessive liquidity and control inflation in the world's second-largest economy. 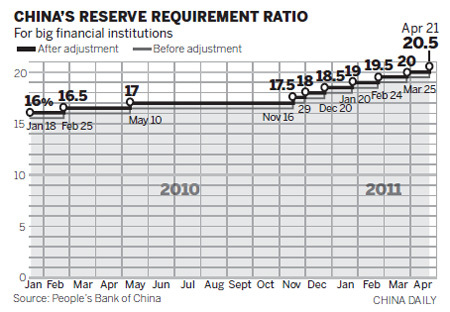 The People's Bank of China, the central bank, announced on Sunday that the measure will be effective from April 21. This is the tenth increase since the beginning of 2010. The new reserve requirements for large commercial banks will be 20.5 percent. It's estimated that the move will soak up about 376.4 billion yuan ($57.66 billion) from the market, and affect lending of about 1.71 trillion yuan, Dong Xian'an, chief economist with Peking First Advisory, said. The measure came after the central bank raised interest rates for the fourth time since October on April 5, and the consumer price index (CPI), a key inflation gauge, rocketed to 5.4 percent in March, a 32-month high, according to data from the National Bureau of Statistics (NBS) released on April 15. Although the CPI showed a month-on-month decline in March of 0.2 percent, rising international grain and oil prices have increased concerns over inflation. The CPI for March was well above the government's 2011 target of 4 percent and fueled expectations of further interest rate hikes and lending restrictions. The government has made reining in prices a key task for this year. China will continue tightening monetary policy for "some time," Zhou Xiaochuan, central bank governor, said on Saturday in Hainan, according to a Bloomberg report, where he was attending the Boao Forum for Asia. "We will remove the monetary factors that are related to inflation ... Our monetary policy will continue to move from moderately loose to prudent. This means properly tightening. The trend will continue for some time." He said there isn't an absolute reserve ceiling for banks. "It depends on many conditions. When those conditions change the force and room for reserve requirement ratio adjustments will also change." The economic data showed China's growth still maintained a strong momentum and confirmed the resolve of policy makers to curb inflation through tightening measures, said Liu Erhfei, country executive of Bank of America Merrill Lynch in China. He expected that the monetary environment will become tighter during the year and dismissed concerns over economic slowdown. The economy grew by a faster-than-expected 9.7 percent in the first quarter, according to NBS on April 15. The central bank reported a day earlier that M2, the broad measure of money supply including cash in circulation and deposits, grew 16.6 percent in March, and new yuan loans for the month also exceeded estimates at 679.4 billion yuan. Lu Zhengwei, chief economist with the Industrial Bank, said earlier that the required reserves for large lenders will probably reach close to 23 percent this year. Dong, from Peking First Advisory, predicted that required reserves would be increased shortly, probably in May, and interest rates would be raised in July to keep inflation at about 4.5 percent.